The suite has everything you will need to have a restful stay in our little home away from home. The fully-equipped kitchen in this private retreat has everything you will need to take care of your meals. The living room area has comfortable seating so you can enjoy the ambiance of our electric fireplace or watch a show on the cable TV. The queen bedroom has garden doors to walk out and enjoy the patio and a walk in closet to store your personal items while you stay. Our bunk room has 4 custom made beds to accommodate adults in comfort and semi privacy. If your bring your children, let us know so we can provide age appropriate toys and books. We also have a playpen and seating for babies as well as children’s dishes. Outside you can sit and enjoy a fire or have a BBQ on the private patio. There are also many trails to explore on the property or visit some of our friendly ranch animals. WiFi is available. And you will find many little touches to make your stay more comfortable. Snacks, pantry items, games, puzzles, and books. It is our aim to make your stay relaxing as possible. We would love to help you plan your adventure in the area. There are many options for recreation in the area in every season. Swimming, boating, hiking, horseback riding, snowshoeing, cross country skiing, snowmobile trails, ski hill etc, all close to us. And if your celebrating a special occasion, let us know. We would love to help make the celebration more special. There is always some one around so if your looking for conversation or someone to sit by the fire with, we would be happy to accommodate. We spent the first 18 years of our marriage in New Brunswick, raising our six children and running a family dairy farm. We loved farming and learning sustainable living practices. In 2014, Lyme disease brought our family to British Columbia to seek treatment. We loved it here so much that we sold our business in NB and moved in a travel trailer to start looking for our new home in the beautiful and wild countryside of BC. The grand Tudor Manor that we found gave us the chance to homestead the way we always wanted to and share our piece of paradise with others through our rentals. This property is very private and peaceful and it is easy to think that the outside world doesn't exist. Originally this property was a working ranch, but hasn't been used in many years. It is our dream to bring it back to its former glory. This place is what our dreams were made of. Privacy, wildlife, and so many adventures waiting just outside our doors. 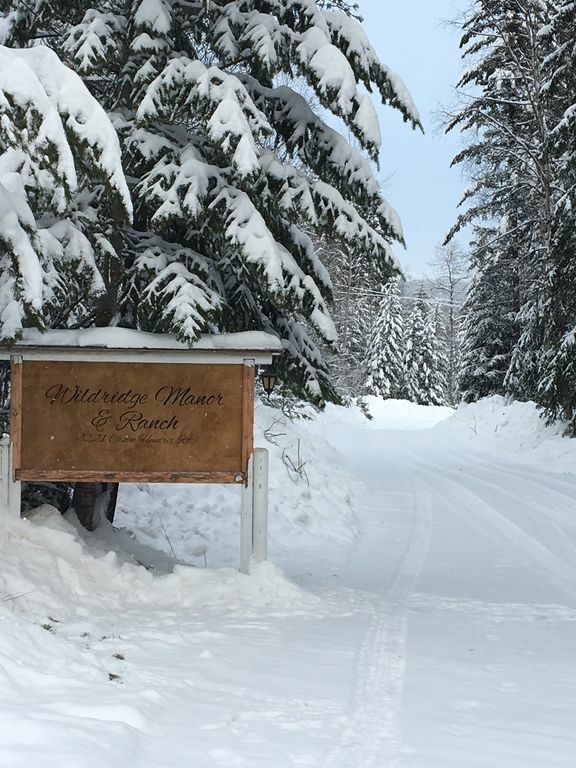 We are on a logging road on the North side of Canim Lake, which provides lots of fishing, boating, and swimming opportunities in the summer and ice fishing, sledding, and snowshoeing in the winter. We are just a few minutes from so many lakes, recreation sites, and hiking trails. A near by ranch offers trail rides and kayaking in the summer and snowshoeing in the winter. Timothy Mountain Ski destination and the trail head to Mica Mountain Riders are close by. Right here on the ranch, you can visit with some of our friendly animals. Help gather some fresh eggs, or feed our friendly goats. In the summer you can try your hand at milking a goat if your brave. We have restored some of the many walking trails on the property for you to enjoy. It is common to see deer, and foxes along the trail. There are beavers, and cranes, geese and many ducks on the pond and 16 acre lake on our property has several Loon families and the lucky visitor has caught a glimpse of the moose or the bear that live near the lake. This is also a great place for bird watchers. We had a biologist stay with us who said its not often he has seen such a wide variety of bird life in one area. Everyday is a new adventure for us here and we love to share a little bit of it with our guests. The home is heated with a wood furnace that we take care of. The suite has an electric fireplace that you can control the temperature on, as well as small space heaters. All bedding is provided as well as extra blankets and pillows for your comfort. Private parking is provided right outside the suite. Coffee pods are provided for our Keurig machine as well as cream and sugar. You will find spices, coffee, tea, sugar, cream, hot chocolate, basket of snacks, oil, salt and pepper, bullion, paper towel, napkins, dish soap. Your private full kitchen has everything needed to prepare meals. The dining area has a table that can be expanded from seating for 4 to seating for 6 based on occupancy. There are booster seats available for children that are able to sit on their own. There are books in the suite to entertain any age. Lots of children books and adult books, both fiction and local historical. We try to have information about local events in the suite for those looking for additional things to do. As well we can make recommendations for day trips in the local area. Please note there are no restaurants in the area. The nearest restaurant and shopping is in 100 Mile House which is 45 min drive from our Ranch.